Shows ‘George the Fifth’ No. 2168 Henry Maudslay but we know no details of the location and train. Can you help us out? The card is LPC 4785 (no. on picture) the original being Tidey T249. This towards the end of a Lancashire trip, and the location of T248 is Golborne, near Lancaster. This view is probable at or near the same location. A down express is all I have on the train, but the last three vehicles are not LNWR. Shouldn’t “Golborne” be “Galgate”? Golborne is near Wigan (and would hardly be described as “near Lancaster”) whereas Galgate is just south of Lancaster. Surely the scenery would be a lot less rural at Golborne. As to what train this might be, the light appears to be coming from the east (so it was morning). My guess would be the 8.05 Liverpool Exchange/7.55 Manchester Victoria to Carlisle/Windermere/Whitehaven (9.05 from Preston) on which the Manchester carriages were normally L&Y and at the rear. The location could be the south end of the cutting on the Winwick Junction to Golborne Junction railway. There certainly is an overbridge in the distance that would fit and are the buildings to the right of the picture Vulcan Works, though it does appear a bit close? The style of construction of the retaining walls should be the clue in narrowing this down. Galgate, not Golborne, I think. In his 1914 (possibly 1913) trip, Tidey was taking photos in the Farington/Euxton area, Ainsdale and at Golborne. The earliest recorded at Galgate are 1933, and again in 1938, although he had a visit to Lancaster 1925/26 period. From his negative numbers this picture is from the 1913/14 trip so is almost certain to be near Golborne. If the location is definitely Golborne, then could the picture be taken from Stones Crossing looking south towards Mill Lane ? The bridge in the distance could be the one leading to Newton Park, the chimney on the right could be from the paper works works near Newton Hall. Also, it could be looking north towards Southworth Road, from the same point. The line along this section is in a cutting, which is lined by brick now, not stone, but the photo shows brickwork in places. I favour looking towards Newton Park, because of the trees to the left of the picture, and if you look close, there is some kind of building in between a gap. 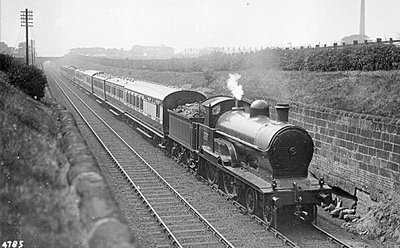 This train is on the down main line just north of Winwick Junction, the photograph being taken from an overbridge, and it will shortly pass under the bridge carrying the Liverpool-Manchester line over the main line at Newton le Willows. In the back ground can be seen the works of Vulcan Foundry Ltd and beyond must be the line from Winwick Junction to Earlestown. The engine number of Henry Maudsay was 2168, by the way, not 2161. In the photo, there seems to be a point just under the bridge in the background, also some kind of building just to the right of the arch on the otherside of the bridge. And what appears to be a building in a gap between the trees to left of the picture, near the telegraph pole stay. You have to magnify it a bit ! The buildings on the right, appear to be the backs of houses rather than factory. Stones Crossing, is the point where the Liverpool & Manchester Railway crosses the mainline. From this vantage point looking north, towards Golborne junction, you would see the bridge on Southworth Road. Looking south you would see the bridge to Newton Park, surrounded by woodland. From here it would be hard to see the Vulcan Foundry. There is a farm bridge over the mainline, near the Vulcan, but that is the last bridge, so seems hardly likely. a) Is the train heading North from Winwick Junction, or South from Golborne junction ? b) And what is the approx distance from the bridge to the photographers view ? Is this photo taken from the Warrington Road  bridge looking south to the Southworth Road bridge? If so the chimney could belong to the waterworks and the houses be in Waterworks Lane. I can't recall whether the waterworks had a chimney and there seem to be more houses in the lane than I would expect. Perhaps someone with more local knowledge could comment. Warrington Road (A573) goes under the railway at this point. Looking at the photo, the viewpoint looks low and above the wall, maybe not at a crossing of the railway at all ? Probably near to one in likelyhood, but nothing concrete as to it being taken from a bridge. With this in mind, a 100 yards or so to the north of where the M6 crosses, the cutting runs out. If the photo was taken at this point looking south, then the bridge could be Southworth Road (A572), and the houses to the right could be on the road, and the chimney could be from the water works, there is one shown on a 1928 map, and it is close to the railway line. The only problem I see with this, is surely the Water Tower would be visible, it was a prominent landmark at the time having been completed in 1906. There are only 5 bridges crossing the line. The last being a farmers bridge at the back of the Vulcan Foundry. If the bridge is the farm bridge, then the view is taken at the very extreme end of the cutting, as north of this point it it is an embankment, but again, the chimney looks too close, and the land drops away toward the Vulcan village, as the line goes into an embankment before levelling out at Winwick Junction, so the houses would probably not be visible from here. All these suggested views are looking south, with the train heading north. Having looked closely at the picture & comments I decided to go out and look for myself. I would tend to agree with Peter Goode’s comments on 7/4, it is almost certainly taken from just south of the location known locally as Stones Crossing, the point where the Liverpool-Manchester line goes over the ‘Winwick cut off’ of the WCML (no road access). The bridge in the distance is the access to Newton Park which was mostly farmland at the time, the photographer could have got to the location from this point and walked through the farm fields, presumably after gaining permission from the landowner. Just visible under the bridge is the bridge over the line on Winwick Road (A49). The tops of the terraced housing above the loco are on Mill Lane where it becomes Winwick Road and the chimney was from the bleach & dye works which occupied the old Paper Mill around this time. The photo would be taken about mid morning judging by the shadows. It is not a well known location for photographs as not only is it difficult for lighting but the surrounding land has always been private, Newton Park was bought in the 1950’s by the NCB and Parkside Colliery built on the site so this location would have been out of bounds in BR days. One person asked could the chimney belong to the Vulcan Foundry, this is not possible as VF was only visible from the A49 but the cutting had run out by then. Most of the cutting walls were sandstone but there was some brickwork, there has been so much repair work in the ensuing 90 years that the cutting does look different, although I did see evidence of the rounded top stones in some places. Location is just south of Stones Crossing, a level crossing for a farm access over the Liverpool and Manchester line. The train is on the down line between Winwick Junction and Golborne Junction and is just about to pass under the L&M. Access to this location could be obtained from Southworth Rd bridge (A 572) where the now demolished water tower used to stand. Incidentally Mystery Photo 36 was taken about 300 metres along the track northbound from the water tower location.